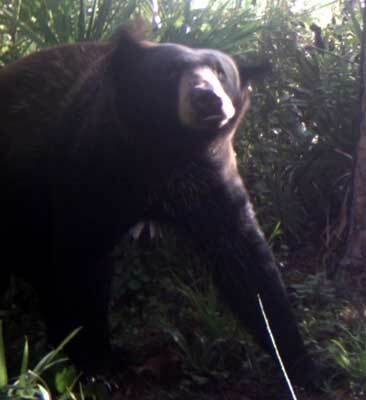 This bear does try his luck getting into the kitchen once in a while. We find scratch marks on the paint, where he tried to pry something open. The last scratch marks he left was over the kitchen door, higher then I can reach. Fortunately we learned to clean the kitchen thoroughly, before leaving camp each time. Took us three bear break ins before smartening up to this. 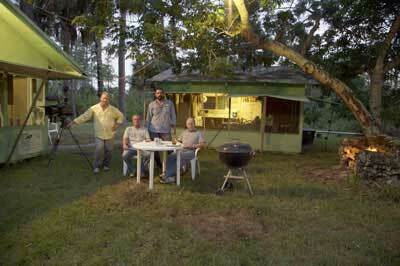 Big Cypress Swamp documentary called the "Western Everglades" will be released around September 2009. It will be shown on the PBS network. 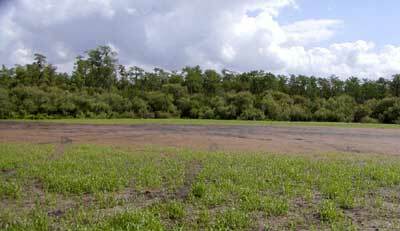 The cinematographer, Elam Stoltzfus and photographer Rick Cruz made a visit to SixPack to film segments of the documentary about private land ownership, ORV use and hunting in the Big Cypress National Preserve. The documentary is about nature, the history of the swamp and ecological challenges of the swamp. I have seen the Final Version proof copy and am happy that the land owners and hunters/sportsmen are presented as an allowed use within the preserve and presented in a positive way. From left to right in the picture at camp SixPack are Elam Stoltzfus, Myself, Rick Cruz and Hoss Cartwright. The picture to the left is of a fox squirrel. In the last few years I have notice a resurgence of this threatened species. I was sitting in a 20 foot tall tree stand during muzzle loading season, when this guy came by looking for a meal. We were eye to eye for a while and after he decided it was ok for me to be there, continued looking for food. 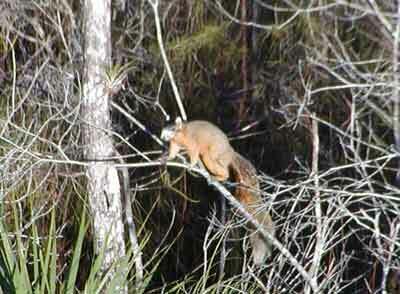 Almost every trip I have made recently, I have seen a fox squirrel while traveling on my ORV. I am not only seeing them around the little deer area, but down the ORV trail near Monroe Station. I wonder how many there has to be before they are taken off the threatened species list? 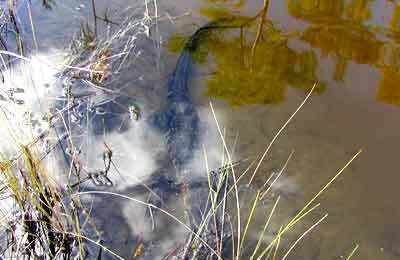 The picture to the right is of an alligator under the water surface on the edge of a buggy trail. I was walking the edge of the trail and one step before stepping on this guy, I saw him. This is how alligators hunt, they lay still waiting for some critter to come within range and then lunge mouth open, jaws snapping shut on their meal. The cloudy water was made by one of the SixPack hunting party, passing by minutes earlier. I don't think this gator would have lunged at me for a meal, but it would have given me a bite, if I had step on his head or near his mouth. Gotta watch you step in the swamp, you never know where these guys will be. 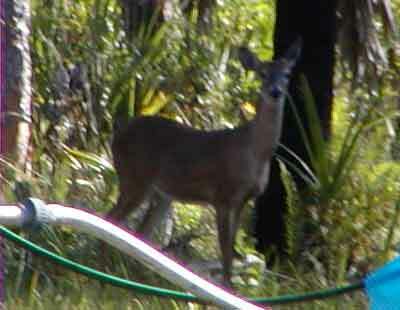 The deer to the left was standing with another deer, up at Calusa airport camp. The pair of them was right in the camp yard amongst the paraphernalia kept at the camp. 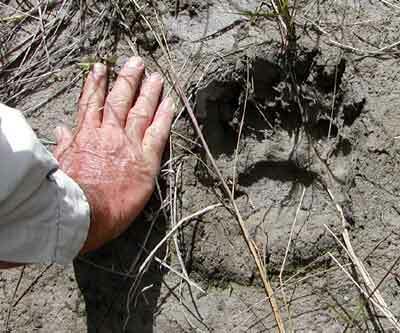 Those that think wild animals are frightened by the presence of man's belongings are wrong. They have an acceptance of man's being in the swamp and are often seen grazing on the grass at camps. It is movement and sound together that frightens them, not seeing man himself. Here is a picture of Grumpy, in the camp yard outside our kitchen. The day before we had run the garden hose out and watered her, during the drought going on. You can see the yellow hose in the picture. She was very appreciative, but is now heading on to find a water hole to spend the rest of the drought in. The hole in the ground behind camp has gone dry. I guess she will not nest and lay eggs as she did last year. We will see! The picture to the right is of Hamilton's pond. The water table has dropped about six feet below ground level. The alligator in the picture was moving on from the pond. While the pond has water in it, the pond itself is not conducive to hunting for food, for an alligator. When the water drops to a level where only rocks and boulders are exposed, animals visiting this pond can easily see the alligator and avoid it. 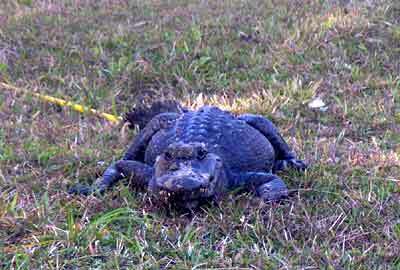 This forces the alligator to find another wet spot where it can be more successful hunting. This year, the water level in Hamilton's pond, was about as low as I have seen it. 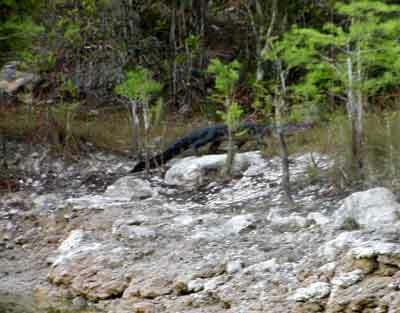 Now here is something you will rarely see in the Big Cypress National Preserve. 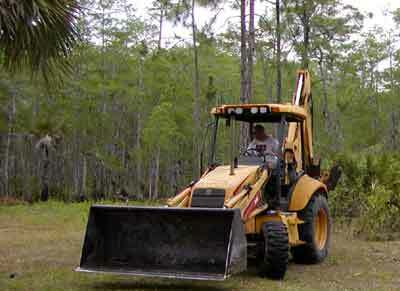 A nearby camp received a special use permit from the NPS to bring a backhoe to their camp. The underbrush around this camp had grown back from the early 1960s clearing around the camp. Permits were obtained from Collier County to move this re-growth back to provide a larger fire break around the buildings. Equipment like this can only access the Big Cypress Swamp, during the dry time of the year. 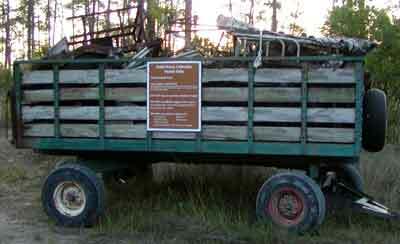 The NPS provided a wagon to camps in the Little Deer area as a place to put junk that acuminated in the area. Before the forming of the Preserve, many camps existed in the area of Little Deer. About 10 or 12 of these camps belonged to people that had purchased land and built a cabin. These became known as "Exempt" Camps. Other camps were built on land that were not owned by the people building the cabin. These camps became known as "squatter" camps, by the NPS. As the NPS bought up the land that the squatter camps were on, they burned them. Most of these camps had been abandoned prior to the NPS obtaining them. This resulted in junk being left at the camp site and for the most part, that junk remains there to this day. The picture to the left is called Mud Lake. The drought this year has dried it up. You can click on the picture and it will enlarge. The little bumps in the picture out on the mud are alligators. Mud Lake is normally filled with water, and the bottom is very silty. 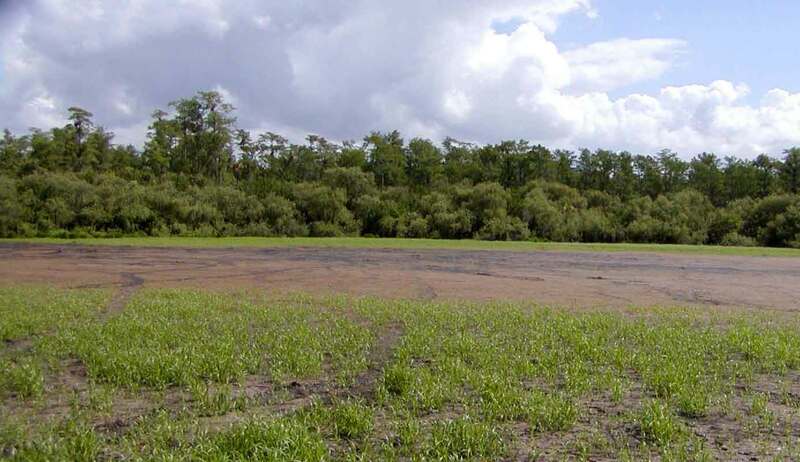 If you try to wade in mud lake, will find yourself stuck in the bottom, waist deep in water, with alligators swimming nearby and you can not get out. Not a good situation. NO! I'm not going to explain how I know that. Even dry it is deceptive. The mud dries forming a crust about a foot thick. If you try to walk on it, the surface becomes like jello. There is still moisture under it and if you break through, you are stuck and alligator food. Mud Lake is best viewed from the shore.